Every Door Direct Mail - Mail Manager - Data Driven. Results Focused. As a local business owner, you need to reach out to your community, but you think sending direct mail to your target audience is too costly and too complicated to organize, so you’ve never tried it. The truth is direct mail can outperform all the other advertising methods you have tried – combined! Introducing Every Door Direct Mail. It’s a new marketing outreach program that enables you to target customers in your local market with pinpoint accuracy without a mailing list, for an amazing postal rate. That means it’s much less expensive but it still delivers outstanding results. Every Door Direct Mail® is Different! The USPS delivers mail to every household in the country, but you only need your message delivered to certain people in your local community. 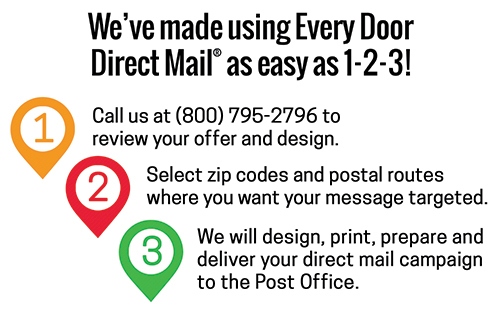 With Every Door Direct Mail ® you get to choose the zip codes and postal routes within your target market. Only send mail to the addresses where delivery makes sense. Not only that, the mailpiece the postal carrier personally drops into mailboxes can be bigger and more dynamic, and still cost less than regular mail. Every Door Direct Mail ® works for all types of local businesses. Whether you make pizza, cut hair, service cars, or serve coffee, you’ll welcome local customers who come clutching the postcard or flyer delivered to their homes. Send a coupon to try a new product or service, announce a sale or grand opening. No matter your objective, our experts help you design a mailpiece focused on increasing traffic to your business. Trusted suppliers to Ventura County businesses for 27 years. Mail Manager and the USPS have partnered to pioneer direct mail marketing solutions in Ventura County for over 27 years. You can trust us to help you grow your business. We’re innovating once more, by introducing you to the Every Door Direct Mail ® program.